Home » Blog » How to prevent hair thinning? Are you one of them who is suffering from excessive hair fall or hair loss or hair thinning? Are you unhappy of your hair growth and feeling rejected while it comes for finding your counterpart or feeling sense of jealous when you see the hair of others? Are you looking for suggestion on how to prevent hair thinning then you should take our free consultation at our clinics in UK, where we provide you with different methods like Platelet Rich Plasma Therapy, Mesotherapy, Follicular Unit Extraction, Follicular Transfer, etc. which will prevent such hair thinning and enjoy thick, smooth and wavy hair which grows naturally. It will not give you dull look at any time. Hair thinning may have various causes which includes of diet, mineral deficiency, severe stress or sickness, pollution or any genetic problem which you have. It has been found out that up to one third of population suffer from the hair thinning in this world. Platelet Rich Plasma Therapy (PRP) – PRP can be used in various ways to prevent the hair thinning, under this technique our own blood is used which contain plasma which are rich in regenerating tissues itself. This plasma is injected on the area where hair is thinning and after some days you will see the result where your hair will start growing. How this technique work, some time the tissue in our scalp dies out due to which hair get thinner day by day so if we provide a new tissue or plasma then it will start regenerating those tissue which in turn will help in growing hair or preventing it from getting thinner. PRP procedure is not use on every people, there are certain factors which need to be taken care like those who have total hair loss PRP is not good option for them. Moreover, it is also costly procedure to be applied. Mesotherapy: Mostly the hair thinning are due to 3 possible reasons i.e. hormone imbalances, lack of right nutrients and reduced blood circulation. Mesotherapy treatment provides solution for all the three problems and prevent from hair thinning. It is non-invasive technique where tiny injections are injected into mesoderm or middle part of skin which provide balance the hormone, start blood circulation as well as provide right nutrient needed for the hair for preventing from getting thinner. Moreover, the procedure also got the name form the method use by surgeons to inject in middle part of skin called mesoderm. It has also observed that there are 90 – 92% of chances for prevent hair thinning through this method and getting effective results. Follicular Unit Extraction: Under this technique follicular units are obtain or extracted from the donor area i.e. back side of head where there are ample amount of hair and transplanted to area where hair are thinning which gives a natural look. The benefit of this technique is: – It is minimal invasive procedure, walk in walk out procedure, does not require any night stay, very next day you can start your routine and it give immediate result. 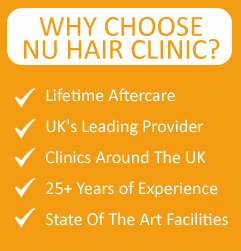 Connect with Nu hair clinic NU clinics in UK if you are looking for how to prevent hair thinning. We have different techniques and accredited surgeons who will help you out in preventing your hair from thinning and providing you with good hair, with nice growth and good appearance too. So what you are waiting for get the free consultation and our team will help you in choosing the best technique which will have minimal risk or complication and effective results to get best hair. This entry was posted on Wednesday, February 10th, 2016 at 12:06 PM	and is filed under Hair Loss Treatment, Hair Transplant, Non Surgical Hair Treatment. You can follow any responses to this entry through the RSS 2.0 feed. Responses are currently closed, but you can trackback from your own site.